This page is a translated version of the page Kaweco and the translation is 100% complete. The Kaweco is one of the oldest companies in Germany, one of the first (preceded only by Soennecken) to enter the writing instruments market. In the first decades of the 1900 Kaweco was the leading fountain pens manufacturer of Germany, competing at international level with the American companies. Unable to adapt to market trends, the company suffered a first bankruptcy in 1929, when it was taken over by another fountain pens manufacturer. While continuing to produce good quality pens in the '30s and in the postwar period, as for many other manufacturers suffered an inexorable decline since the 60s, with the introduction of the ballpoint pen. To date, the brand was acquired by the H & M Gutberlet Gmbh to recreates modern versions of the popular models of the company. The origins of the Kaweco date back to the 1883, when what later became the core of the company was created in Heidelberg under the name Heidelberger Federhalterfabrik, in the back of a carpenter shop. There are few news on this initial period of activity of the company, neither we have precise information on who were the founders and owners (the current site lists these Luce and Ensslen), or details on the initial production that is supposed to be consists of dip pens for England imported nibs. It ir also assumed that the company has been in contact with A. Morton, founder of the eponymous American company, whose pens and gold nibs were sold on by Heidelberger Federhalterfabrik. The first fountain pens production of the Heidelberger Federhalterfabrik goes back to 1892, with hard rubber eyedropper and safety pens. 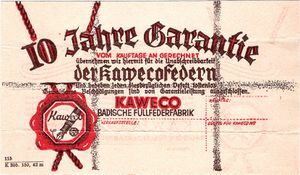 In 1899 two businessmen, Heinrich Koch and Rudolph Weber acquired the company, which became the Heidelberger Federhalterfabrik Koch, Weber & Compagnie, shifting production to Handschuhsheim, and marketing began to be carried out under the brand name KaWeCo, born from the abbreviation of Koch, Weber & Compagnie, other brands used at the time were Perkeo and Omega. In the same period is believed to have begun the nibs importation from A. Morton & Co. in New York. At the beginning of the century the company had only a few dozen workers (something like 25 employees in 1903), but the production of black chased hard rubber safety fountain pens was of excellent quality and had a great success. In 1903 were introduced the mechanical pencils KO-MIO, in 1908te company was awarded the first patent for a fountain pen. In 1909 the company founded subsidiaries in Vienna, Paris and Zurich, as well as having numerous sales agencies across Europe and beyond (eg. in Turkey in Istanbul, in Egypt in Cairo and in Russia in St. Petersburg). In this period roughly two-thirds of its production was destined for the foreign market, and it is possible, given the links with A. Morton & Co. that also some American produced fountain pens have been resold with Kaweco brand. In 1911 iwas published the first official catalog; more than 120 different models were available, purchased to order according to customer requirements. In this year there was the market introduction of the series of the Kaweco branded 601-607 safety models. Other models of that time were Perkeo, Swallow, Lilliput and Omega. In the same period (1912) there was also the introduction of the 616 model, a black hard rubber safety model, small and very short, designed for use by athletes and officials, who is the first version of Sport, the most famous model of the company. They were also provided eight different filling systems, although the most common were the eyedropper filler and the safety. In particular, the latter was one of the strengths of Kaweco, who can claim, with Waterman, to be one of the first companies to use this system, for which in 1908 (or 1909) it had made an improved version, using a threaded knob for the mechanismo, so that you can screw the cap on it, and then use it in to displace the nib group. Another distinctive feature of the first years of the century production was the variety of forms, with cylindrical and tapered caps, with interlocking or screw cap closures, square or round bodies, and of the finishes, with gold rolled metal or variously worked silver and gold overlays, mother of pearl inserts, enamel decorations and the rare and sophisticated tula. Between 1913 and 1914 the company bought the A. Morton & Co., who was reputed to be the oldest gold nibs factory in the world. Workers, engineers and machinery were transfered from New York to Heidelberg to teach the techniques of production, while maintaining production of nibs in New York. With the start of World War I most of the American personnel returned home; but in the meantime the production of nibs had become excellent and fully equivalent to the one carried out in New York under the Morton brand. The Kaweco reached the height of its size in the early '20s, when he became the first manufacturer in Germany, with sales of around 130,000 units a year. In 1924 gave the company employed around 1,200 people, but already in 1925 it began to feel the first symptoms of the crisis, losing ground to rivals like Soennecken and Montblanc. Also in that same period were born near Heidelberg a number of competitors such as Reform and the KWG, and others brand were founded by the best technicians who left Kaweco to create of their own companies, like the Böhler brothers with Osmia or Heinrich Hebborn, who in 1925 acquired the Cologne Kaweco branch, of which he was director, to create Luxor. 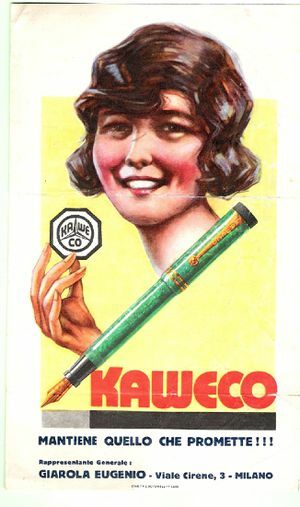 The Kaweco logo before 1929 bankruptcy. The competition began to grow increasingly fierce and Kaweco sales, which remained anchored to the production of black hard rubber safety pens, lost more and more ground when other producers began to introduce colorful patterns celluloid models with more sophisticated filling systems. In particular exports, which had been a company strong point, abruptly fell in front of competition from the United States manufacturers. In 1926, the company officially adopted the name Kaweco instead of the original Heidelberger Federhalterfabrik, and introduced new button filler models, also the Omega series was expanded introducing new lever filler models. It was also introduced the Helios brand for the lower range safety models. The material, however, was always black hard rubber, which was now permanently associated with the idea of backwardness. Without a strategy for revitalizing production the situation continued to worsen, there was first a reduction of capital, but hounded by creditors, the company went bankrupt, and on 24 May 1929 and was forced into liquidation. The Badische Federhalterfabrik Knust, Woringen & Grube logo, before Kaweco acquisition. At that time the KWG was looking for a brand that would replace their own unattractive Arumia, and started contacts with Max Sauter, the Kaweco liquidator. After months of negotiations September 31 1929, the KWG bought the brand and changed its name to Kaweco Badische Füllhalterfabrik, Woringen & Grube, for the occasion was also introduced (at the same Sauter suggestion) the new Kaweco logo, merger of the two company logos. The agreement provided for the sale of the brand, the stocks of goods and sales contracts, but not the buildings that remained available to the debtors. Regarding the production facilities were also acquired a few machines, being the majority of these, dedicated to safety production, become obsolete. The new Kaweco tried to make a clean break with the past, the old models were removed from the market, those in the distribution network recalled and replaced, or repurchased and destroyed, and they also tried to block the repair. The traditional safety models were renewed with a flat head cap made of black hard rubber (400, 401, 402, 404, 406) or mottled (500, 501, 502, 504, 506). The button filler "U" series Arumia models were rebranded under Kaweco as Kaweco Meisterklasse, in the same colors. The Colleg line was maintained as Colleg-Extra and became a real cheaper products line, aimed for school use. The new pens were of lower size, quality and cost, but this was to help during a period of severe economic crisis. In the early 30's were made various changes of the models, the Colleg-Extra became the Kaweco Special, and was produced in various sizes and with round and hexagonal body, always button filler. In 1934 was introduced the piston filler Dia model with transparent ink section, initially in sizes 83 and 85 and then in the version 125, larger and with bottom and cap top in rolled gold and chiseled metal. It then was flanked by Kaweco Colleg model. In 1935 was introduced Sport model, always in celluloid with piston filler and transparent section, but octagonal and very short, sold combined with a pencil in a leather bag to carry in the pocket, a forerunner of the design introduced by Pilot with his Elite model, using of a long cap that mounted on the bottom of the pen makes it of normal length. For its small size model Sport was advertised for use by athletes and for its convenience enjoyed considerable success. In 1937 was introduced the Elite model, in versions 183, 185, 187 and 190, with piston filler, and the celluloid body engraved with a decorative guilloché. Finally the more tapered Special model. Most of the production was made before hard rubber and then black celluloid, only the export models were produced in colored celluloid. Other models of this era were the Kadett, the Schulkaweco and the Helios. World War II caused a sharp decrease of the raw materials and manpower available, until 1941 the company maintained good production levels, but from 1943 to 1945 it ceased almost completely. After the war, production resumed; lines Dia and Elite were proposed again in the new measures, but with chrome-nickel nib, only the flagship model, the Carat, which appeared for the first time in the 1950 catalog with measures 283, 285, 287 and 290 had a two-tone gold nib. Also in 1950 resumed the Sport model production, who obtained a good success. Economic lines Colleg and Kadett were maintained for students; all pens were produced with piston filler. In 1960 Frederik Grube died, leaving the company to his sons, but the advent of the ballpoint pen had made it less and less significant, which still continued to produce pens and writing instruments, adapting to various trends (with plastic pens and with the use of hooded nib introduced in 1962) and focusing heavily on the educational market, as for the VP model of 1964, cartridge filler and hooded nib. The production continued without significant innovations, reinventing old models, until the early 80s. The final failure occurred for bankruptcy in 1981, and the brand was acquired in 1995 by the H&M Gutberlet Gmbh who took over the company to put on the market, the following year, a modern version of the most famous model company, the Sport. Review for two Kaweco Sport with some material taken from here without attribution. ↑ patent D.R.G.M. 224101, that's unknown in the database European Patent Office. ↑ this trademark appears on two pens depicted in a 1925 catalog and in a page of the 1928 one. This page was last edited on 9 September 2017, at 02:19.